Happy Mother’s Day! I thought it would be perfect to post a favorite dish I used to make for my Mother after she no longer cooked. She loved this Chicken with Lemon and Artichokes. The sauce has a lot of flavor and is bright, garlicky and lemony. Couscous soaks it up beautifully and when served on a platter, this simple dish seems like so much more. 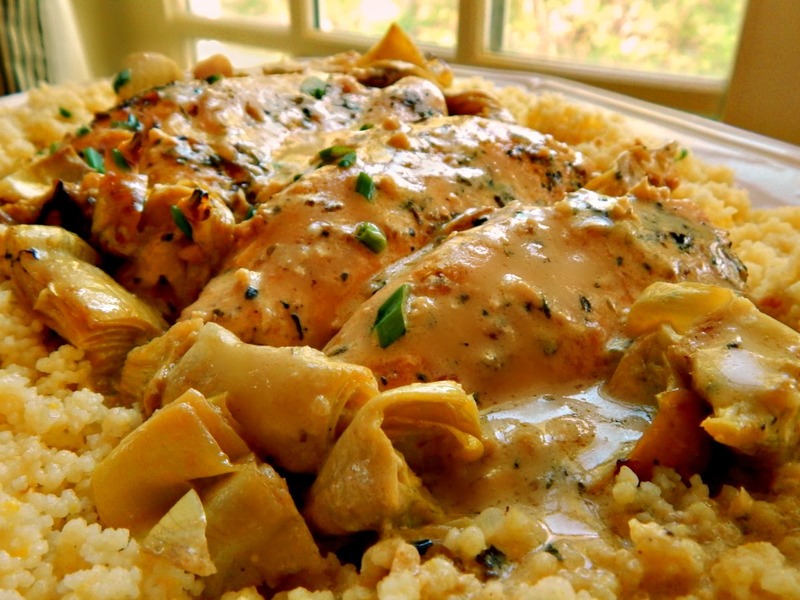 Chicken with Lemon and Artichokes really leans towards the Greek side of things. The artichokes and lemon make it so spring-like and the wine makes it special. There are only a few ingredients and they’re cooked simply but this is really a fantastic meal. It’s also an easy dish to make; another one of my dishes that relies on basic ingredients and masquerades around looking all fancy and “gourmet” when it’s really just smoke and mirrors! I’ve made this today to serve four, but more chicken breasts can easily be added along with another can of artichokes. There’s plenty of sauce as is. When I have company, I’ve made up to eight breasts. I normally serve this with couscous, although a rice pilaf or orzo will work, too. I keep the couscous very simple so it’s a gorgeous foil for the chicken and sauce. I used a cup of couscous and two cups of chicken broth. Bring the broth to a boil, pour over couscous and cover for 5 minutes. Remove the cover and fluff with a fork. Easy, peasy. If you’re serving more people, just increase the amounts. You’ll want to serve a vegetable with this, maybe some lovely carrots or broccoli, perhaps a simple green salad. And serve the rest of the wine! My favorite to use in this dish is Sauvignon blanc, although there are many white wines that would be excellent here. And just so you know, I’m not going to leave you high and dry with three egg whites! My next post will show just what to do with them. The chicken dish ran about $5.78 to make, the couscous was a pantry clean out! I’m sure it was bought on sale and doesn’t reflect current pricing, and your cost will vary depending on what you serve as a side. Rice is always a stellar deal, quinoa a bit pricier but a healthier option. Drain artichokes well and add to a small bowl. Whisk wine, lemon juice garlic and oil in a large bowl, and pour a small amount, about 1/2 cup over the artichokes. Toss together. Add chicken to the rest of the mixture in the large bowl and refrigerate at least 30 minutes and up to four. Preheat oven to 375 degrees. Place chicken on a rimmed baking sheet, lined with foil if desired, reserve the marinade. Sprinkle with 1/2 the oregano and salt and pepper if desired. Place in oven. About fifteen minutes after the chicken is in the oven, drain the artichokes and add to the chicken. Again, reserve the marinade. In a small saucepan, bring marinade to a boil. Baste the chicken liberally with about 1/3rd of the marinade. Reserve the rest of the mixture. Cook the chicken for a total of 30 to 40 minutes until cooked through, 165 degrees. Remove from oven. Brush a bit of the sauce on the baking sheet over the chicken, place the chicken on a plate and tent with foil. The chicken may be a bit pale but brushing with some of the caramelized juices towards the edges of the pan will color it beautifully. Add juices to a measuring cup, there should be about a cup and a half. If not, add in some of the reserved marinade. Whisk three egg yolks into the mixture and bring to a good simmer over medium heat, whisking constantly. Cook for about three minutes until sauce is slightly thickened. Add remaining oregano to the sauce to taste, season with salt and pepper. Serve with couscous, rice or orzo, on a large platter. A beautiful presentation is make a well in the center and add the chicken to the middle. Pour some of the sauce over the chicken, pass the rest at the table. Garnish with green onion if desired. I mentioned earlier that I wouldn’t leave you high and dry when it came to those three leftover egg whites! If you’re in the mood for dessert, consider making Meringue Nests. They can be piped, as I did, or simply dolloped out in a free-form fashion. These are filled with just a touch of plain yogurt and a few berries, but can be filled with just about anything you’d like. This entry was posted in Click here for Bargain Meals, Click here for Fabulous Food Posts and tagged Artichokes, Bargain Meal of the Week, Chicken, Easy Recipe, egg yolks, Eggs, Frugal Hausfrau, Greek, Lemon, Wine. Bookmark the permalink. How interesting putting egg yolk in there – does it get a slight batter-texture or maybe not since the rest of the marinade goes on soon after? Some great flavors in there, though, so sounds one to try! Thanks for sharing with Fiesta Friday. Hi Caroline – thanks for hosting FF and stopping by. The egg yolks just slightly thickens the sauce so it’s beautiful and creamy – without the use of any flour like a white sauce or cream. It’s based off a Greek Avgolemono sauce. This is in the oven, marinating in the bath of juices as I type. I made a bed of quinoa instead of rice or orzo but still used broth. It is better that way anyhow. I will be serving this with brown sugar sweetened, cinnamon carrots. A lot of my favorite smells and tastes in this dish. The house smells absolutely amazing! Quinoa! Wow! I have to think to use it more often and I seem to forget! I like it and think it’s fun to eat. My neighbor hates it and refuses to eat it or pronounce it right, and from time to time I try to convince her by bringing by little dishes of it! I hope it turns out well and you and the Missus like it! It was very good, but I used marinated artichokes and should have used plain. It enhanced the lemon and was a little more tart than it would have been. The quinoa was perfect for this and we typically use it as a side dish mixed with tomato, black olive, feta, you name it. We also mix red and white quinoa, which lends a visual appeal too. Thank you for the prompt on this dish as I will make it again. Cheers! I’m glad you liked it and I think I should mention plain artichokes! I appreciate the feedback and I love the idea of the quinoa prepared like that. I’m going to try that – and I just happen to have all those things in my fridge right now. My neighbor, who doesn’t like quinoa, just gave me a package of it! You betcha! As we say in MN! Pinning! Love the flavours in this dish. Thanks, Virginia! I appreciate the pin! The flavors are fantastic! I trust you had a fantastic Mother’s Day! This dish sounds so amazing and simplistic, plus I love the Mediterranean flair. I will have to make this for my wife. Before I got very far into reading the blog, I thought to myself, this sounds Mediterranean. Well, you spelled that out. Lol! Hey, thanks for stopping by! It’s a favorite – can I bribe you with a piece, perhaps? Hahahaha. If only virtue eating were a thing. Wouldn’t it be just perfect, we could taste the food but not gain the weight. I know you live in the cold north, too – recipes like this just say Spring to me! They’re bright, fresh and light! Lovely! I’ve never had good luck with canned artichokes – they taste tinny to me. Do you have a special brand that you use? I don’t have a special brand, but they are soaked in the marinade, and come out delicious! I seldom go to the expense of buying fresh for a dish like this, but I have to admit it would be fantastic! I have bought frozen artichokes before, already prepared. Yes, I did, thanks! And I hope the same for you. My son and his girlfriend took me out to dinner which was so sweet! This looks so delicious. I love artichokes! Love the total combination with lemon and couscous! Thanks! I think the presentation makes it, although my photography isn’t the best at showing it! 🙂 And couscous is just so quick to make. I love a good lemon chicken dish and this looks absolutely delicious! Thanks much! Me, too. I was looking through my recipe box and realized I have about a dozen! There may be more coming! What a pretty dish. I love lemon and chicken combos and your tasty use of artichoke. Cannot wait to try this. How was the food catchup? Thanks, Brendon! This is really a family favorite! I cannot wait to try this out!!! Creamy and delicious looking though I wonder what I could sub for the artichokes. Maybe asparagus? I’ve tried making a lemony sauce for chicken before and all I could taste was lemon with nothing else for flavour behind it. Thanks! The egg yolk in the sauce mellows out the lemon a bit, and of course there’s lots of garlic, too, and as much or little pepper as you’d like and the oregano. I think asparagus would be lovely, especially if you can find the big fat kind instead of the little skinny ones that seem to be so popular these days. I’m thinking you might not want to cook the asparagus as long? Carrots come to mind, too!